Yemen and its foreign partners have agreed to work together to fight the threat of al-Qaeda. US Secretary of State Hillary Clinton told the international conference in London bringing unity and stability to Yemen was an urgent national priority. Donors from Western and Gulf countries have also agreed to meet in the Saudi capital, Riyadh, in February. The meeting was prompted by the failed Christmas Day alleged bid to blow up a US plane, claimed by al-Qaeda in Yemen. Ministers and officials from some 20 Western and Arab countries gathered to discuss security and wider economic and political problems facing Yemen, the poorest state in the Arab world. Mrs Clinton said the US had signed a three-year agreement focused on addressing security and development issues in Yemen. "To help the people of Yemen, we - the international community - can and must do more. And so must the Yemeni government," she said. She said military action alone would not be enough, adding that the international community would work with Yemen to promote human rights, build democratic institutions and combat corruption. She urged the Yemeni government to enact its 10-point reform programme to lessen the influence of extremist groups. British Foreign Secretary David Miliband, who chaired the talks, said the Yemeni government had agreed to start discussions with the IMF on economic reform. Mr Miliband also announced the launch of a Friends of Yemen process to address wider challenges such as the economy, governance, justice and law enforcement. Yemen's Prime Minister Ali Mujawar welcomed the international support, but said it was "unacceptable" to portray Yemen as a failed state and warned against any violations of its sovereignty. Gordon Brown called on the London meeting to galvanise support for the Gulf state after the alleged US airliner bomb plot on 25 December 2009. Al-Qaeda operatives in Yemen claimed responsibility amid fears the country is becoming a haven for terrorists. Umar Farouk Abdulmutallab, the suspect in the alleged bomb plot, is said to have told investigators that he was supplied with explosives in Yemen. The talks also involved representatives of the European Union, United Nations, World Bank and the International Monetary Fund (IMF). BBC security correspondent Frank Gardner said the state's problems were both complex and profound. "The poorest Arab country, its population is ballooning, oil revenues are dwindling, the water tables are sinking and it's fighting a bloody insurgency that has already embroiled the Saudi army on its northern border," he said. "Into that unhappy mix comes a resurgent al-Qaeda that has chosen Yemen for its new base in the Middle East, and is now threatening to use it as a springboard to attack the West and its allies." 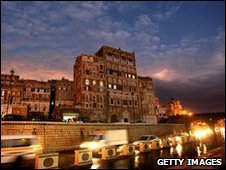 Prior to the meeting, Foreign Office Minister Ivan Lewis said the meeting was important because Yemen was "not a failed state" but "an incredibly fragile state". Yemen's Foreign Minister Abu Bakr al-Qirbi said that his country wanted "international support to build infrastructure, combat poverty and create jobs, as well as support in combating terrorism". But he told the BBC that the idea of US military bases on Yemeni soil was "inconceivable". Arab League secretary general Amr Moussa told BBC News he questioned how effective the meeting could be. "I don't know how a conference like that can decide something useful, something reasonable for Yemen... in a couple of hours," he said. He added it was "strange" and a "very dangerous sign" that his organisation had not been invited to the talks. Mr Moussa said the Arab League was concerned not solely about al-Qaeda but about Yemen's problems as a whole and that community reconciliation was required.